The Horror Genre. What horror films do you know about or have heard of? What horror films do you know about or have heard of? What is the same things. 2 What horror films do you know about or have heard of? What horror films do you know about or have heard of? What is the same things in horror films/movies? What is the same things in horror films/movies? 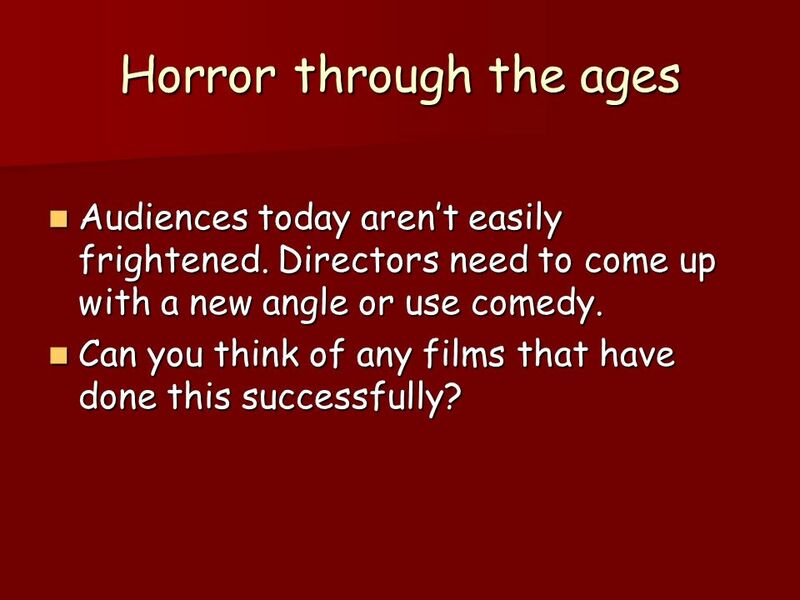 3 The Horror Genre - the audience experiences/feels, fear or disgust. - the audience experiences/feels, fear or disgust. - Stories often have an evil force, event or supernatural character. - Stories often have an evil force, event or supernatural character. - Settings are usually in small town America, in quiet neighbourhoods and in woods. - Settings are usually in small town America, in quiet neighbourhoods and in woods. - Shadows and darkness play an important part. - Shadows and darkness play an important part. -The colour red is often symbolic. -The colour red is often symbolic. 4 Horror through the ages Audiences today arent easily frightened. Directors need to come up with a new angle or use comedy. Audiences today arent easily frightened. Directors need to come up with a new angle or use comedy. Can you think of any films that have done this successfully? Can you think of any films that have done this successfully? 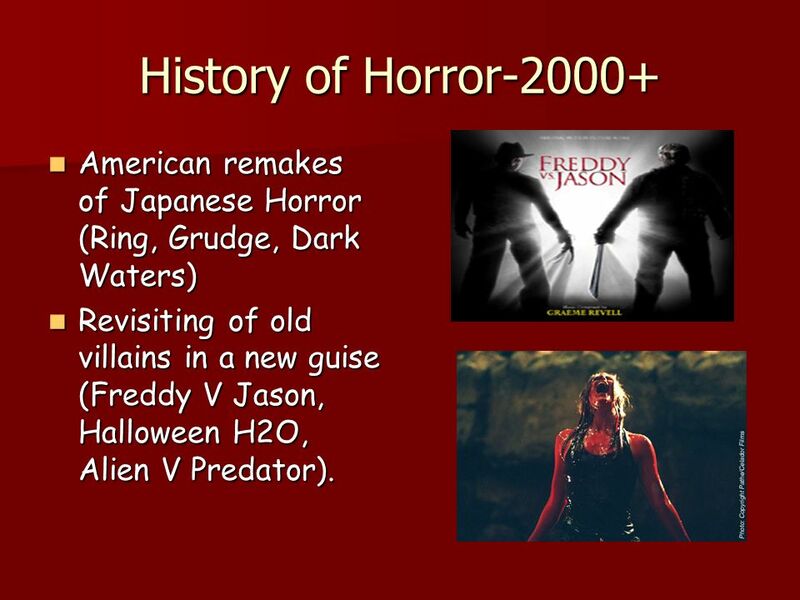 9 History of Horror-2000+ American remakes of Japanese Horror (Ring, Grudge, Dark Waters) American remakes of Japanese Horror (Ring, Grudge, Dark Waters) Revisiting of old villains in a new guise (Freddy V Jason, Halloween H2O, Alien V Predator). Revisiting of old villains in a new guise (Freddy V Jason, Halloween H2O, Alien V Predator). 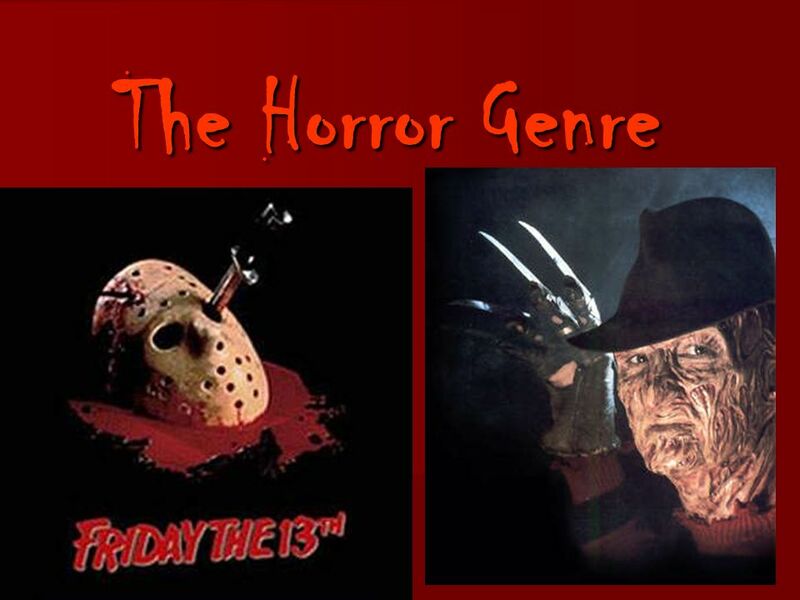 10 Horror sub genres Can you think of any horror sub genres? Can you think of any horror sub genres? 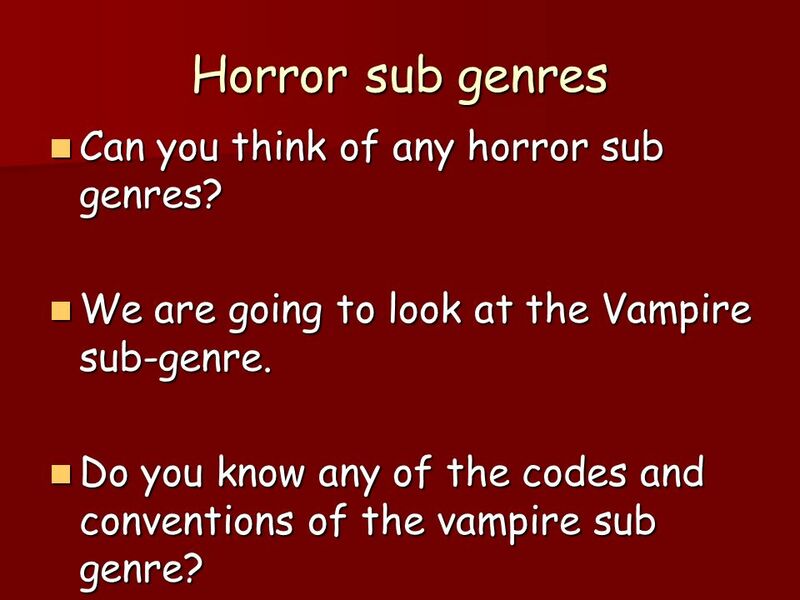 We are going to look at the Vampire sub-genre. 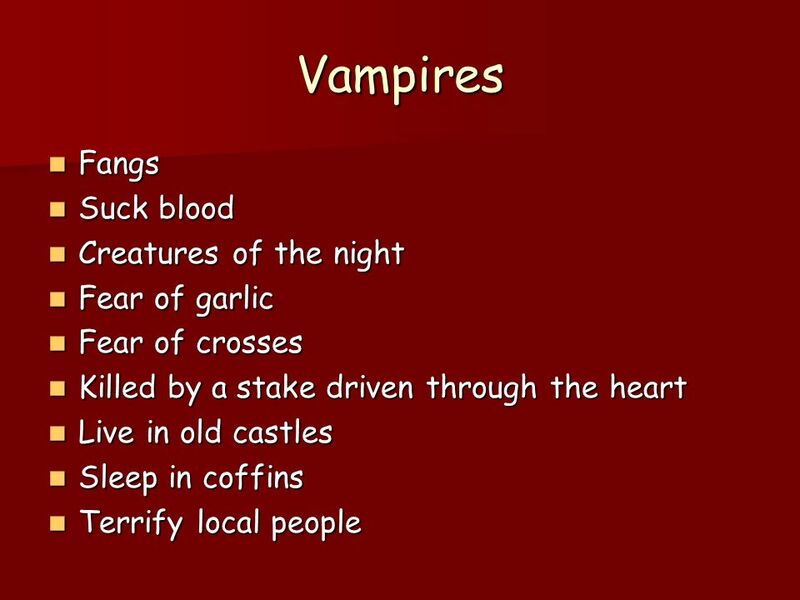 We are going to look at the Vampire sub-genre. Do you know any of the codes and conventions of the vampire sub genre? Do you know any of the codes and conventions of the vampire sub genre? 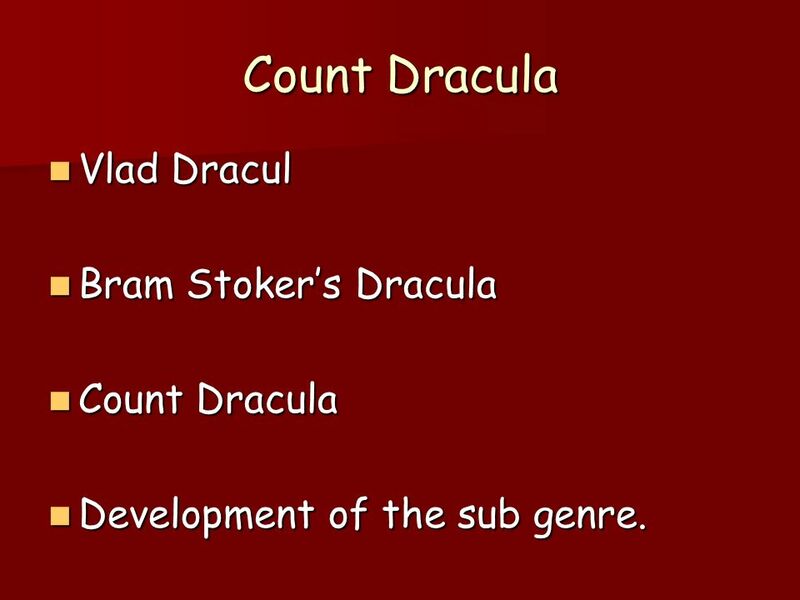 12 Count Dracula Vlad Dracul Vlad Dracul Bram Stokers Dracula Bram Stokers Dracula Count Dracula Count Dracula Development of the sub genre. Development of the sub genre. 13 Your own vampire film You are a film producer, you have the opportunity to produce your own vampire movie. 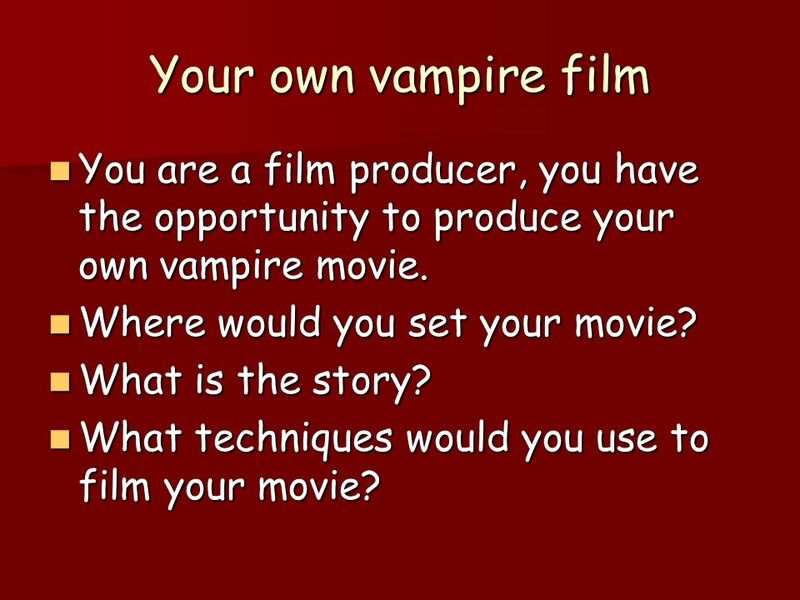 You are a film producer, you have the opportunity to produce your own vampire movie. Where would you set your movie? Where would you set your movie? What is the story? What is the story? What techniques would you use to film your movie? What techniques would you use to film your movie? 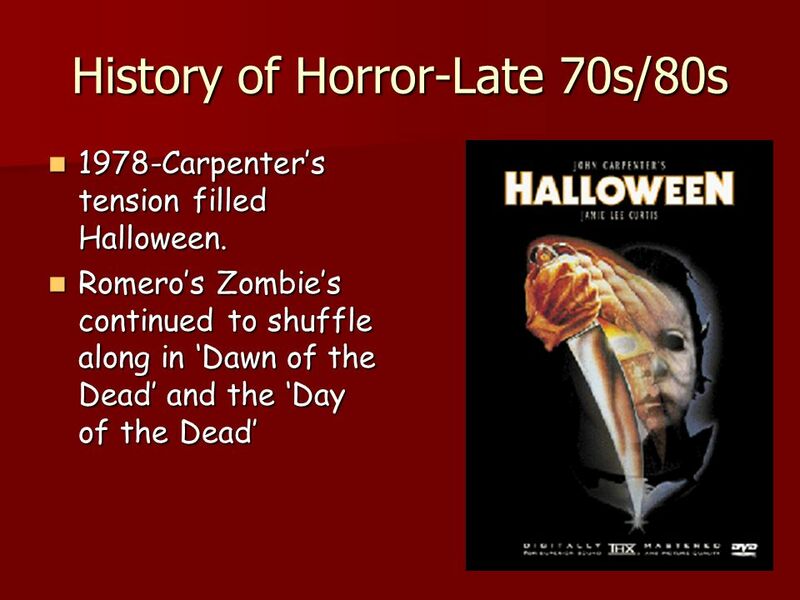 Download ppt "The Horror Genre. What horror films do you know about or have heard of? What horror films do you know about or have heard of? What is the same things." Fantasy An Introduction. Definition: Usually a story in which a reality other than normal reality is used Usually a story in which a reality other than. 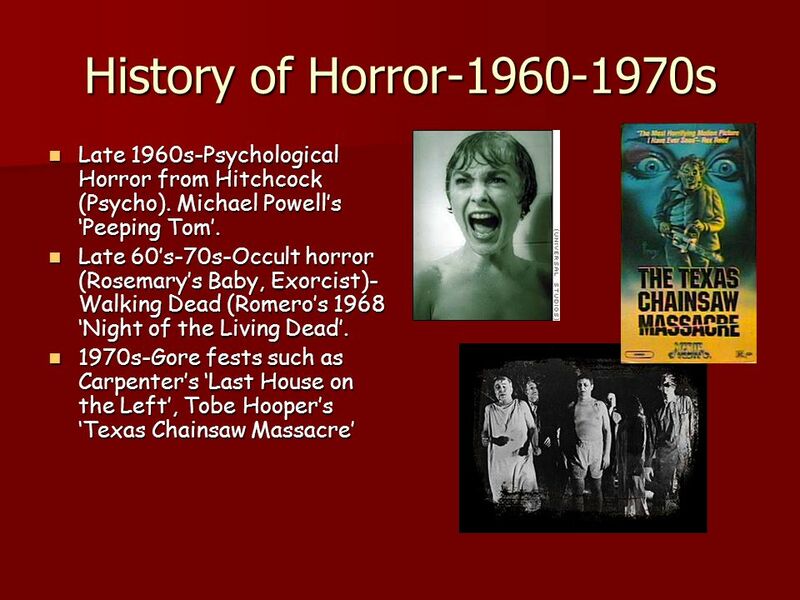 History of the Horror Film By Daren Wilkerson Taken from 100 Horror Movies You Must See Before You Die By Stephen Jay Schneider. A2 MEDIA HOMEWORK EXPLORING HORROR SUB- GENRES By Jocie-Leigh Bayliss. Horror Genre Mr. Oporta. Fear Fear is the most basic human instinct. Fear is the most powerful teacher. Some people love to be scared. WARNING! The following presentation contains images not suitable for sensitive viewers. Halloween. Halloween is celebrated on October 31 st. Halloween started 2,000 years ago in Europe. They believed October 31 st was the one night when the. Production and distribution company research. New Line Cinema, is an American film studio. It was founded in 1967 by Robert Shaye as a film distribution.  Rev. Graham Hess Rev. Graham Hess  Merrill Hess Merrill Hess  Morgan Hess Morgan Morgan Hess  Bo Hess Bo Hess  Officer Paski Officer Paski  Ray. Bell Ringer  Match the terms…  1. Rodsa. Controls amount of light entering eye.  2. Conesb. Allows us to see black & white.  3. Irisc. Muscle in eye. Studying Horror Films The Conventions. So You Think You Know Horror Name the films that the following characters appear in: Name the films that the following. Vampire Fictions: Rewriting Myths IWIS. Learning Aims and Objectives To explore how Bram Stoker’s Dracula and the myth of the vampire has been adopted. The Genre Cycle! 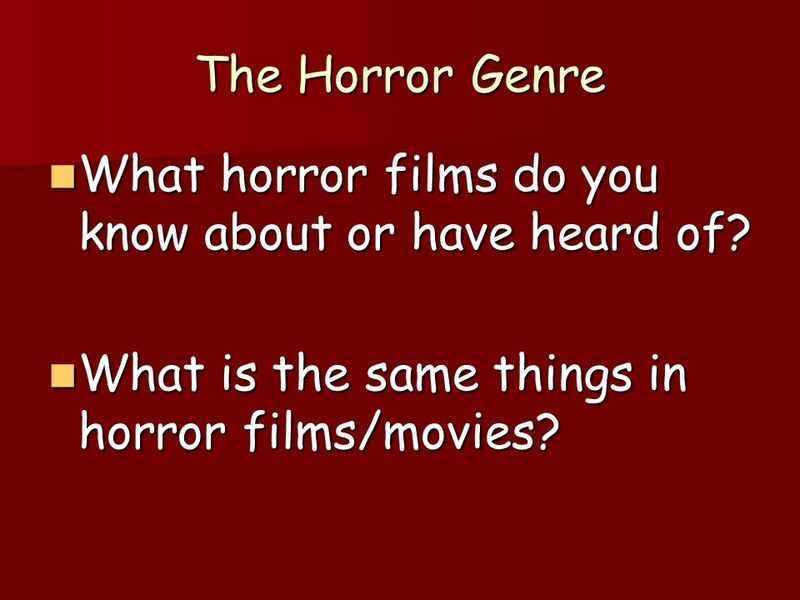 Learning Objective/Kaupapa: 1.Develop our understanding of changes in the horror genre so we can make informed connections and comparisons. 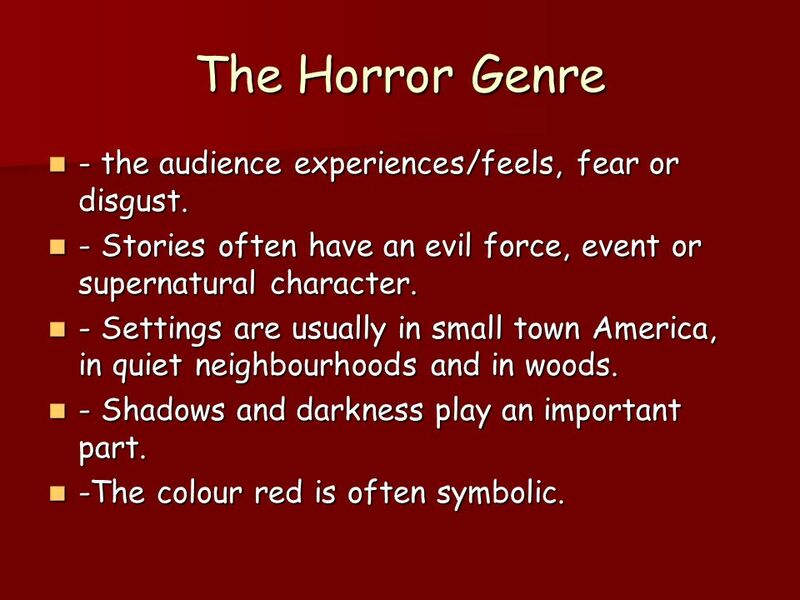 The Horror Genre. Learning Intentions To learn the codes and conventions of the Horror genre. 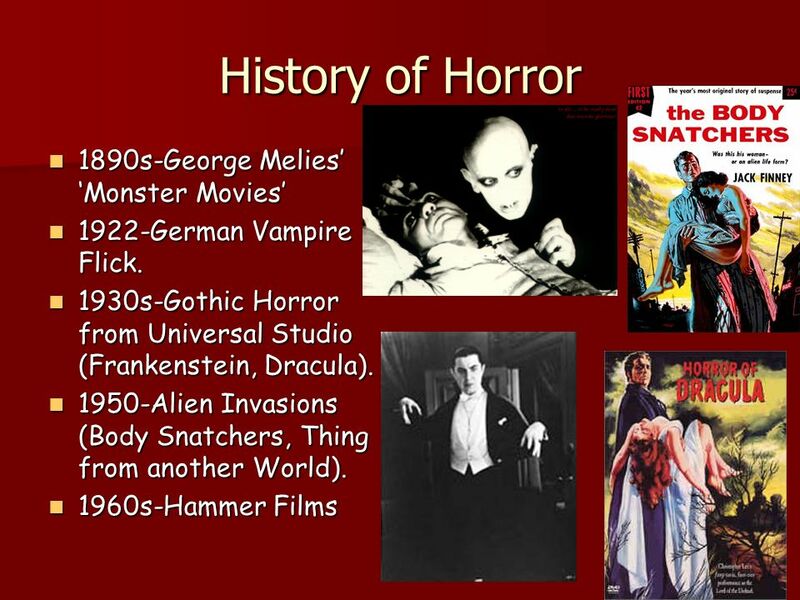 To learn the codes and conventions of the Horror genre.  Horror films are unsettling films designed to frighten and panic, cause dread, alarm, to invoke our hidden worst fears often in a terrifying shocking.